ROME, ITALY (15 October 2018)—Indigenous Peoples, local communities, women’s groups, citizens, and activists from at least 25 different countries today kicked off two weeks of public action and events to demand that governments respect their land rights. A new policy brief highlights the link between recognizing community land rights and ensuring global food security and climate protection. Today, the Ogiek People in Kenya, the Acholi People in Uganda, the Shipibo in Peru, and numerous others around the world called for the recognition of their rights. 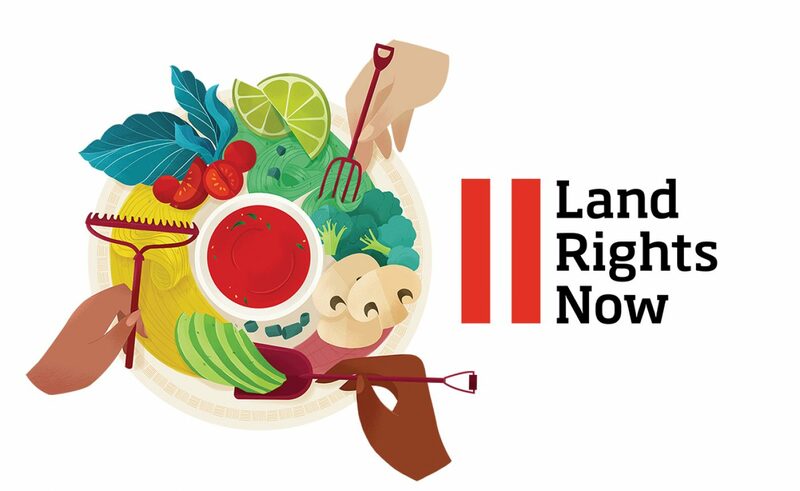 These actions are part of the Land Rights Now campaign, launched in March 2016 to double the amount of land owned or controlled by Indigenous Peoples and local communities by 2020, and now counting more than 800 organizations and groups rallying behind it. Governments around the world largely fail to recognize these rights: despite having customary ownership to half the world’s lands, Indigenous Peoples and local communities only have legal ownership over 10 percent of it. This gap leaves community lands vulnerable to expropriation for large-scale agriculture, mining, or infrastructure, which typically benefit fewer people and are more environmentally destructive than land use by local communities. According to the Land Matrix, at least 49 million hectares worldwide have been subject to international large-scale land acquisitions over the last decade. These are largely driven by consumers’ demand for cheap food or energy, with oil palm (6 million hectares), jatropha (2.4 million hectares), and sugar cane (1.9 million hectares) dominating. Small-scale food producers provide 70 percent of the world’s food. Evidence shows that small-scale food production in Africa and Asia is more efficient and has higher crop yields per hectare than larger operations. Secure land rights can also boost farmers’ productivity by 60 percent and more than double family income. Women’s land rights are particularly important given their crucial role in ensuring local food security and managing community resources. Community land management also helps regulate the climate that enables global food production. Communities have successfully safeguarded many of the world’s forests for generations. Research shows that their lands store massive amounts of carbon—at least 300 billion megatons—and that secure rights lead to lower rates of deforestation and higher rates of carbon storage. At least one-third of the carbon stored in community forests in the tropics and sub-tropics is on lands that lack formal legal recognition, leaving them vulnerable to land grabs that can destroy livelihoods, devastate the environment, and destroy local food sources. The Cambodia Indigenous Peoples Alliance is hosting a radio talk show, exhibitions, and dialogues with parliamentarians and other stakeholders. The Fundación Nativo is hosting an event in Caracas, Venezuela to raise awareness among people from urban areas regarding usage of indigenous food. The Colectivo para las Culturas Originarias in México is hosting a demonstration of indigenous recipes and ingredients with Otomí chefs. Despite a landmark 2017 ruling by the African Court on Human and Peoples’ Rights that the Ogiek Peoples are the rightful owners of Mau forest in Kenya, the government has yet to return their customary lands to them. About 40,000 Ogiek live in the Mau forest, which is the source of their food, income, medicine, shelter, and cultural sites, with beekeeping their primary livelihood source. They have acted as guardians of these lands for generations, yet they face encroachment from logging, tea plantations, and illegal settlements. Thousands have been forcefully evicted from their homes. The construction of the Asian Highway through Karen State has already resulted in widespread land confiscations and military clashes that displaced more than 1,000 people. Community advocates fear that the next phase of the road—which will pass through 17 villages and 1 town—is proceeding without the consent of the affected communities and will lead to further conflicts and displacements. The next phase is being funded by the Asian Development Bank and is set to be completed by 2020. Many lost their lands altogether in the construction of the first segment of the highway. With 70 percent of the region’s population dependent on the land for survival, this puts entire communities at risk. Villagers were retroactively informed that they would receive compensation, but it was not enough to buy new land and there was no opportunity for negotiation. The Indigenous Shipibo community of Santa Clara de Uchunya, in the Ucayali region of the Peruvian Amazon, is facing invasion of its ancestral lands by corporate oil palm plantations and land traffickers. The community relies on its ancestral territory for hunting, fishing, farming, and gathering fruit. Yet the government has only recognized their rights to a small part of the territory, while companies circumvent the law to turn the forests over to large-scale monoculture. “Oil palm doesn’t bring us any future, it brings misfortune. It brings poverty. They deceive you and in the end they grab your land and you are nothing. Your children become their slaves and you no longer own your territory,” said Rodrigo López, a community member in Santa Clara de Uchunya. Despite the Shipibo’s claim to the land, the government gave individual titles to outside settlers, who sold their lands to a palm oil company in 2012, leading to the clear cutting of the forests without the Shipibo’s consent. Despite challenges in court and the Roundtable on Sustainable Palm Oil (RSPO), palm oil production continues, and new settlers have received title to parts of the Shipibo’s lands. The case has become emblematic of what is occurring in Peru and across the Amazon region. Large-scale agriculture projects—deeply connected to international food and energy markets—are destroying forests traditionally occupied by local peoples. Rather than being recognized for their role in having helped preserved precious wildlife, the Acholi People in Uganda are being criminalized and evicted from their customary lands. The Acholi people customarily inhabit part of the Amuru District in Northern Uganda, but the Uganda Wildlife Authority (UWA) says they are illegally residing in a designated wildlife area. Since 2011, the UWA has backed a series of forcible evictions, carried out by rangers, police, and soldiers from the national army, the Uganda People’s Defence Force. Over 844 huts have been destroyed and 26,000 people displaced. A 2017 court case declared that the land belongs to the Acholi and evictions must cease—but they have continued in 2018. One man was killed by an army officer, and an elderly woman died while fleeing an eviction attempt. Two hundred people have been forcibly removed from their lands this year. 769 Q’echi families were violently evicted from their homes in the Polochic Valley to make room for a sugar plantation. The government promised to return this land, but more than half of the families are still waiting. Large-scale palm oil, sugar, and banana plantations; cattle ranches; and mining and energy project are increasingly encroaching on the lands of the Mayan Q’eqchi and Pomoqchi peoples, who have inhabited the Polochic Valley and the areas around Lake Izabal since pre-colonial times. This is a common pattern across the country: Indigenous Peoples constitute more than half of Guatemala’s population, but still contend with violence, discrimination, and the failure to recognize their land rights. Without land, indigenous families in Guatemala often suffer extreme poverty and hunger. Research finds that local economic development is typically worse under plantation models than the traditional small-scale farming they replace. In Australia, members of the Yuin Nation—a coastal people who have for generations depended on sustainable fishing in their ancestral waters for their subsistence—have faced criminal charges and persecution by the government. This crackdown on small-scale cultural fishing by members of the Yuin Nation belies the fact that commercial fishing operations in nearby waters bring in much larger hauls with more detrimental environmental impacts, and that this production is largely for export rather than sustainable consumption. Today’s actions are part of a growing movement by indigenous and local communities around the world demanding respect for their rights, mobilizing to ensure that their voices are heard, and highlighting the role they play in the global struggle to prevent climate crisis. “Land Rights Now is a unifying call to respect the rights of up to 2.5 billion people worldwide who rely on community-held lands. These rights underpin global food security and are vital to the fight against climate change. In spite of incredible risks, Indigenous Peoples and local communities are raising their voices and taking action to defend their rights and protect the resources we all depend on. It is time for the world to listen,” said Carling.